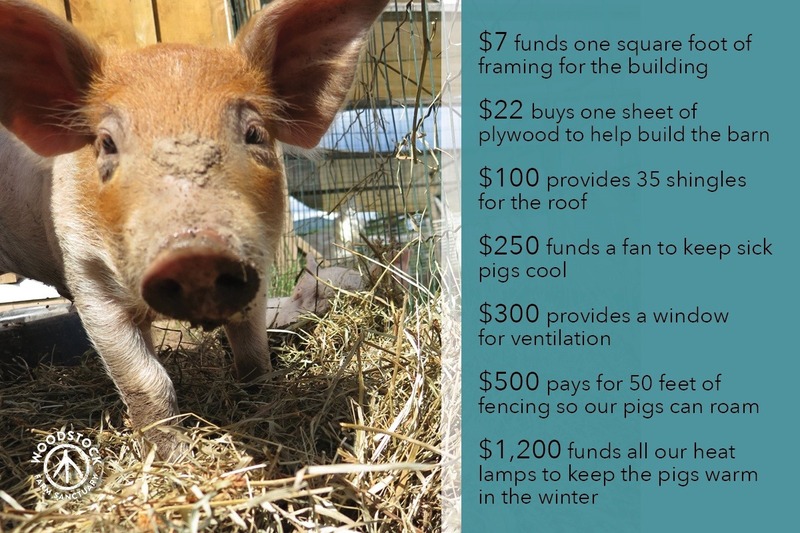 Fundraiser by Kirstie Kimball, Development Director at WFS : New digs for pigs AND help us rescue more pigs! New digs for pigs AND help us rescue more pigs! We have a PIG announcement and we need your help! Woodstock Farm Sanctuary is building a new barn for our pigs! As some of our population ages, we need more space to keep our pigs happy. We're coming to you, our community, to ask for help funding our new pig barn. We need to raise $37,390 to be able to break ground on the barn. Can you donate today to help us build our newest barn? This barn will have three suites. Two will be for current residents, like Olive. The third will provide isolation for pigs in need of medical care. Moving some pigs out of our current barns opens up space, so we can rescue more pigs! This barn is special because it backs up to a wooded area, allowing our pigs lots of room to roam and root! We can't wait to give our current residents the space they deserve and to welcome more pigs to lifelong sanctuary. We can't do this work of rescue and lifelong sanctuary without you. In order to build the foundation and frame for the new barn, we need to raise $37,390. We know we can count on you, like we have so many times before, so that we can provide our pigs with a warm, safe, spacious barn where they can spend the rest of their lives. Whether you donate $7 or $700, your gift is significant. -ALL donors receive an invite to a special tour and visit with our pigs on site! -Donations over $500 are honored with an engraved brick in front of the barn. -Donations over $1,000 are honored with an engraved brick in front of the barn, a plaque on our 2019 donor wall, and a special invitation to a one-on-one tour. -Donations over $5,000 are honored with a bench on the property, as well as all $1,000-level acknowledgment. -Donations over $10,000 are eligible to name a pasture at the new pig barn. We have no room to rescue more pigs right now, and it breaks our hearts every time we have to say no to someone who needs a home. Sanctuaries are often the only place farmed animals in need of rescue can go. Right now, our pig barn is full, so we can't take in animals whose last hope for rescue is Woodstock Farm Sanctuary. We rescue animals to provide them with lifelong sanctuary, the highest quality medical care, and love. Every time we rescue an animal, we commit ourselves to them for the rest of their life, no matter the cost. Sanctuaries are the only place where farmed animals can live out their natural lives. And sanctuaries teach people about the most exploited animals, fostering direct connections with farmed animals. The lives we save spare thousands more through advocacy. As people hear stories of what happened to our residents, they open their hearts and change their diets, creating a more compassionate world. 93 percent of people who visit us make a personal connection with an animal and change their eating habits because of it. We rescue to provide lifelong sanctuary. We also rescue to create a world rooted in compassion and justice for all beings. Will you join us in this mission by donating today and helping us rescue more pigs? One of our residents, Olive, will be moving into our new pig barn! Olive rescued herself, escaping from a farm or slaughterhouse, when she was really young and was found wandering in the town of Olive, NY-- hence her name! She's lived at Woodstock Farm Sanctuary since 2011. 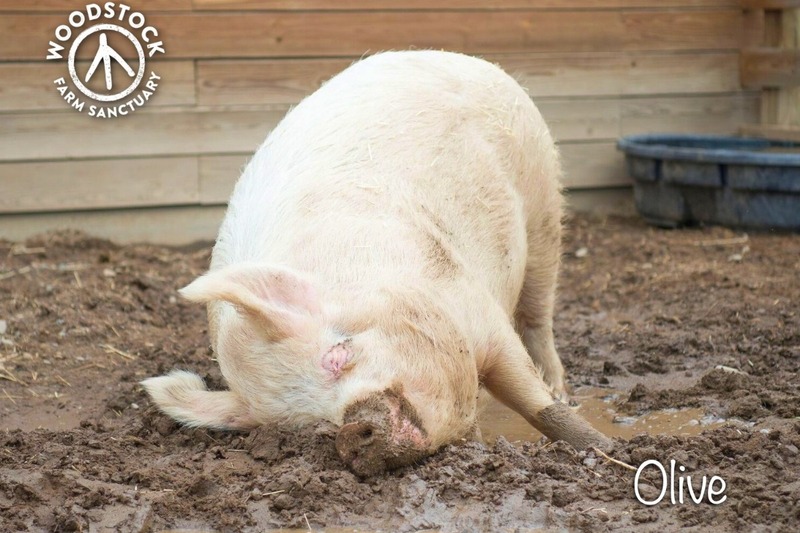 We love Olive – who is very people friendly – but she is very selective about her pig housemates. She lived with sisters Patsy and Judy for years but when those girls passed away, Olive had a hard time integrating with our other senior pigs and she was too bossy with young boys Ari and Rudy! After a series of play dates, sweet older gentleman Stanley has now settled in with her. Olive is so happy to have a lifelong companion again and Stanley doesn't mind her being a little bossy. He's also now deaf so maybe he just tunes her out when she's being pushy! 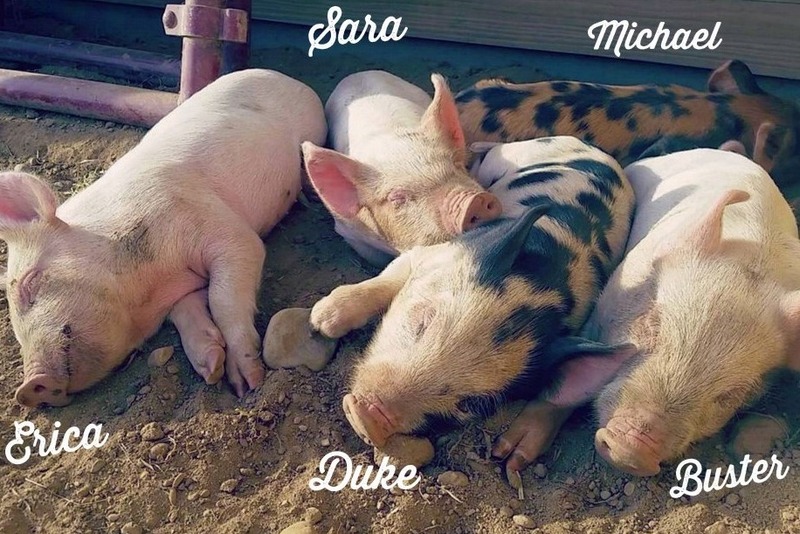 Throughout their lives, pigs form friendships and connections with each other that can change. Our current pig barn is completely full, which means that as our younger pigs grow up and grow older, we don't have room to allow them to pick their friends like Olive was able to do. This is critical for keeping older pigs happy and healthy. Pigs are so much like us -- they want to pick their friends and housemates! The new barn will ensure that all of our pigs can choose their friends. A new pig barn will be a home for our senior pigs with enough space for a deluxe suite for Olive and Stanley to grow old together. It will also have enough space for our other senior pigs – Antonio, Amelia, Bertha, and Curly. And with the new pig barn, we can continue to allow our pigs to pick their friends as well as rescue others in dire need. Can we count on you to help pigs like Olive live a life where they safe, loved? The only reason we can provide lifelong sanctuary for our residents is because people like YOU donate to provide the highest quality medical care, barns, and food for our residents. We are 100% donor funded and need all hands on deck to help us build this barn! We know that we can make it happen, because you’ve come through for us so many times before. We can’t WAIT for you to see Olive and Stanley in their new space. And we are excited to rescue more pigs and give them sanctuary for the rest of their lives. Sanctuaries are the only places these pigs have to go and we can’t wait to welcome them here and introduce them to you. Will you donate right now and help us break ground on our new barn? You can donate on our GoFundMe or you can donate at donate.woodstocksanctuary.org and put the word PIGS! in your comment and we will count it towards the barn. Our Development Director, Kirstie, wants to show you the location of our new barn! Thank you so much for donating! We are just $900 away from being a THIRD of the way to our goal in just one week. We cannot thank you enough. If you haven't yet, please share on social media and spread the word! We hit 150 donors overnight and we are SO CLOSE to our first milestone. If we hit $9,347 by Monday at midnight, that means we raised one-fourth of our goal in JUSTONEWEEK. We truly cannot do this work without you. Your donation directly saves lives and allows us to provide more space to our current pig residents. Thank you, thank you, thank you. Can you take a moment this Sunday morning to share our GoFundMe on social media or tell your friends about our fundraiser over brunch? We are so thankful for your donation to help us build this pig barn. 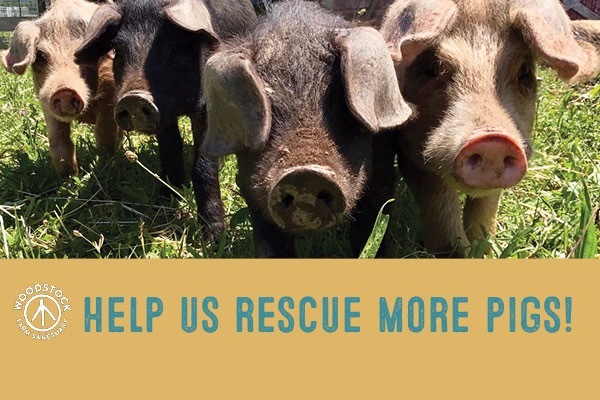 Let's rescue more pigs together! PS: In case you missed it, here's a video of Olive on her 9th birthday last Friday! Thank you so much for donating to help us break ground on our new pig barn. We are 20% of the way to our goal and YOU are the only reason we can build this barn and rescue more pigs. For that, we are so grateful. Let's build this barn together and save more lives! PS: Please share our GoFundMe on social media! It's the best way for us to spread the word about our new barn.